My over the road neighbour was very kind to me and bought back two lumps of Sheoak, Casuarina ?? for me to play with. I first split off the heart piece that was only half the depth of the block and made a little bottle for my Vietnam Vet Buddy who visited on Saturday. 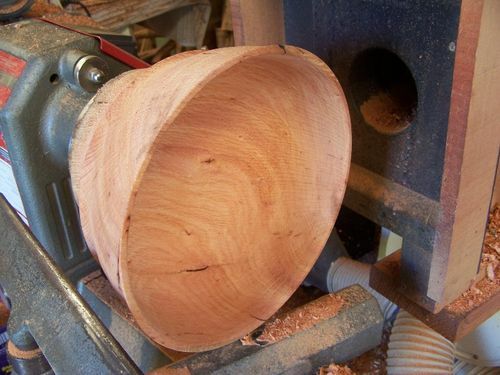 There was quite a lot of sapwood on this piece and it worked out that this was the safest mounting option, however it would have been good if I could have mounted it more securely, as I could have cored out a couple of bowls, but I did manage to get a 6inch lump out of the middle. I won’t tell you how, because worksafe would have my guts for garters. Needless to say the middle piece is very nicely coloured, and I will post when finished. My right shoulder is a bit sore from the Chisel jumping, but that will wear off in a couple of days. The main bowl is turning out pretty well so far. 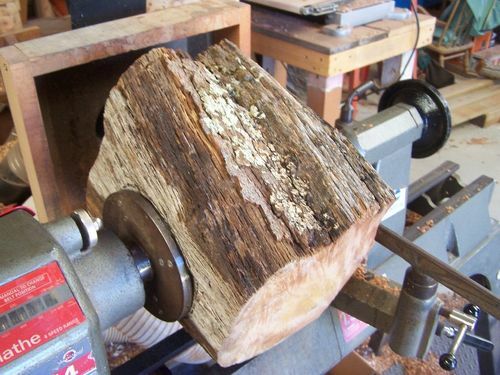 I have turned off the sapwood now. Here are some pics so far. Whats going on here?... do you have a death wish !! Dont be worrying about about Worksafe, what would have happened if your wife caught you. Take it easy man we need good LJs!! 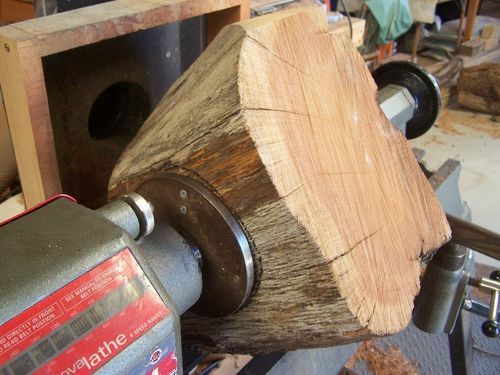 Thats got to be the most evil looking piece of wood with maim and kill all over it if I ever saw one! Even in its still form … bloody scary. Its a wonder the lathe didnt refuse to start! Ok now with that over its an amazing transformation. Looks good to me Bob, we all need to take a bit of a risk and get the adrenaline running. 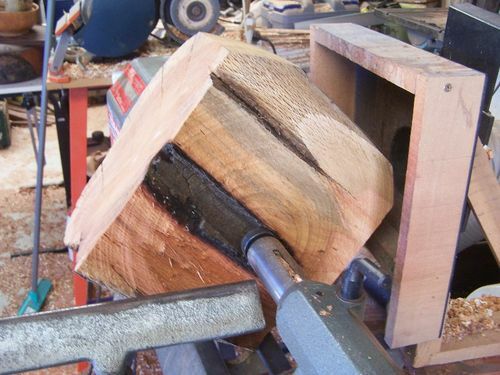 A nice lump of sheoak, I like the color and grain, and look forward to seeing to seeing the finished article. 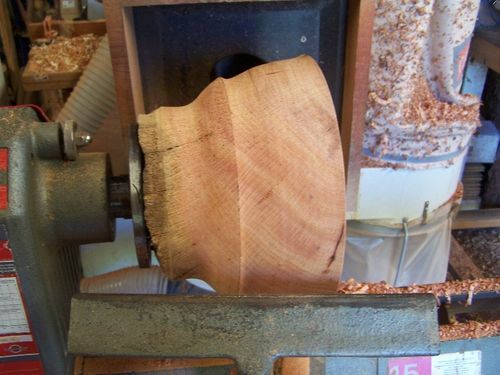 Nice piece of turning so far, well done. OMG!, Honorable Bob. I have exactly the same conundrum before me on the Dungeon floor, “How to get the doggone thing to spin unshakingly enough to make it round. Silver Maple in my case. Continue this journey through the Honorable Bob’s head, that I may learn. Please, Sir. PLEASE!!! Very select piece Bob. It looks to have a red tint to it in the picture. Rub some sawdust on that shoulder and finish it so we can see the end results. I love when the ugly ducklings turn into the swan.